On 21 November 1947, Wilhelm Abel founded a mining engineering company in Düsseldorf, Germany specializing in the manufacture of pumps for the coal mining industry. Today, Abel GmbH, which is headquartered in Büchen, near Hamburg, designs and manufactures a wide range of products comprising membrane, solids handling, high-pressure and marine pumps. These pumps are used in the mining, wastewater management, energy, ceramic, chemical, petrochemical, cement industry and ship building industries. Abel GmbH, which is now a subsidiary of Hillenbrand Inc, sells its pumps worldwide. 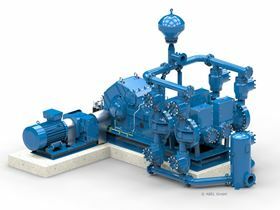 The company recently shipped its 100th HMQ (Hydraulic Membrane (diaphragm) Quadruplex) pump to India just ahead of the 70th anniversary. “It is, for me, a particularly exciting task to make, over the next years, a successful made in Germany company become more successful in the emerging economies worldwide,” said Abel managing director Jaak Palisaar.